As Bill Nelson’s high-priced Washington lawyers go to court today to argue against a process that they previously argued for (see 2016 ruling on curing absentee ballots), it’s worth noting that Marc Elias is currently making the exact opposite argument in a similar case in Arizona. 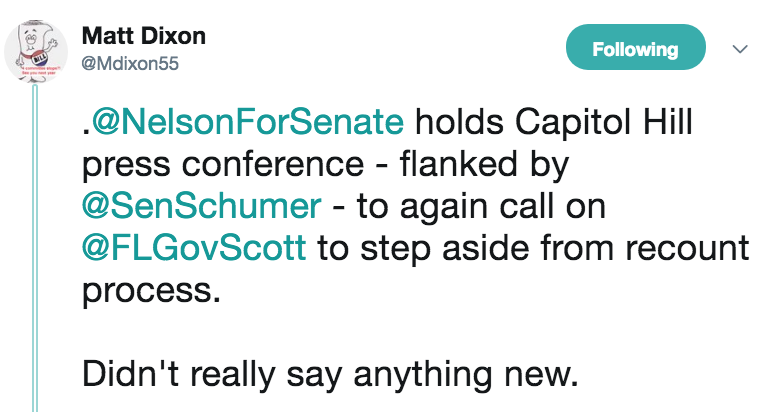 Meanwhile, Bill Nelson finally emerged from witness protection yesterday to read talking points prepared for him by Chuck Schumer (who looked over his shoulder and, presumably, pulled the strings). Let’s be honest about what’s going on here. Rick Scott won this race by a margin that is mathematically impossible to close in a recount. They know they lost. They know that Rick Scott is the Senator-elect. They don’t care, because this isn’t about 2018 and this isn’t about Bill Nelson. This is about 2020. Chuck Schumer and his national Democrat comrades are working overtime to change Florida’s election laws so they can try to win a presidential election two years from now. When the machine recount is complete on Thursday, Bill Nelson will have to decide if he wants to preserve his legacy and go out with dignity or if he wants to be forever remembered as the guy that liberal interest groups used in an effort to win the presidential election two years early. Ours are filed to make sure that Florida law (which is designed to prevent voter fraud) is followed. Theirs are filed with the goal of disregarding Florida law in an effort to count unlawful ballots. 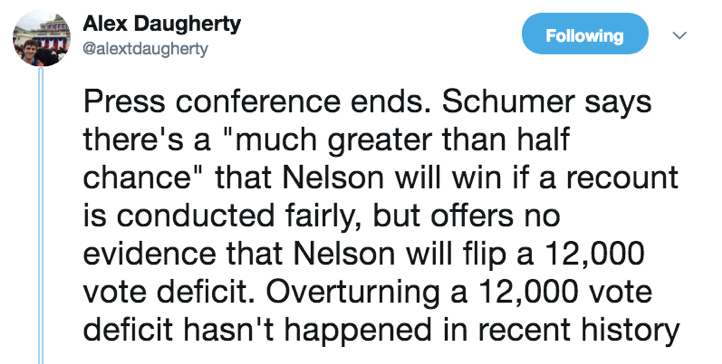 Reminder: Governor Scott won the election by a margin that is mathematically impossible to close without fraud and Bill Nelson can decline a recount at any time. Next Story Why would Dems intentionally deceive voters?